Medium Density Fibreboard (MDF) is an engineered wood-based sheet material made by bonding together wood fibres with a synthetic resin adhesive. MDF is extremely versatile and can be machined and finished to a high standard. As a result, MDF has replaced solid timber as a low-cost alternative in a wide range of applications across industry. Sydenhams stock MDF sheets in Standard Grade and Moisture Resistant Grade. Standard MDF offers a smooth board, which is suitable for cutting, machining and moulding (care should be taken with the dust produced, face masks should be used). It can also be painted, veneered, sprayed and is widely used in the furniture trade. 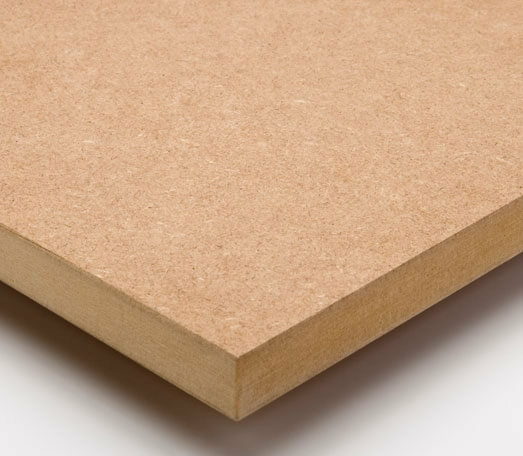 Moisture Resistant MDF Offers all of the properties as the standard MDF but can also be used where the board is exposed to moisture.We also stock MDF Neatmatch, a MDF sheet with a double 'v' and groove machined into the board to povide an attractive an labour saving alternative to wood panelling. We stock neatmatch in both long and cross grain, moisture restistant and 9mm thick. Standard MDF Thicknesses stocked - 6mm, 9mm, 12mm, 18mm, and 25mm. Moisture Resistant MDF - Easily recognised by its green core, designed for use in humid conditions such and kitchens and bathrooms etc. To compliment our stock profile, Sydenhams can also supply a huge range of specialist MDF. Veneered MDF - A veneer is a thin slice of timber used to cover base materials. Usually available with one or both faces veneered in a variety of finishes. Flexible MDF - A sheet with a grooved underside allowing use in many applications.